The European Federation of Internal Medicine (EFIM), The Icelandic Society of Internal Medicine, The Irish Association of Internal Medicine (IAIM), The Norwegian Society for Internal Medicine and The Swedish Society of Internal Medicine. 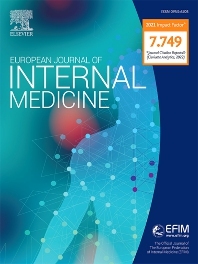 The journal is devoted to promoting the science and practise of internal medicine in Europe. To this end the journal publishes original scientific articles, editorials, short communications and other information relevant to internal medicine and related fields. The journal also publishes news and articles concerning the activities and policies of the Federation as well as those of national internal medicine societies.